wonderful, wonderful, wonderful! congratulations Lynne Hoppe!!!!! and congrats to your fellow recipients! hey you there with your heart all opened and shining! I feel the same way... do i even know any bloggers that aren't wonderful??? ah.. they are a great royal bunch. i grin when i come here. must be the infinite bliss hanging in the atomic molecules of our thoughts mingling with the day light and moonlight and even yes, the dust. Ha ha. congrats lynne! don't you just love that kathy d has a blog! i love it!!!!!!!!! Hi Lynne, now this is a buzzing place to be. well I can't think of anyone more deserving of this than you Lynne - your thoughtfulness and compassion oozes out of every post you make. 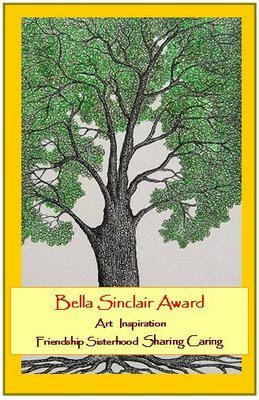 And an award with a picture of a tree on it is sooooooo meant for you! Congratulations I'm of to visit your friends now! Whoo Hoo! Congrats! You so deserve it! I love coming here and seeing what you are up to. And I can't wait to venture out to see these award recipients. This is such a beautiful award ! I don't think I have seen it before. You certainly deserve it, with all the wonderful light and art you put into this sweet blogland world. Thank you so much for including me in your list of recipients. Your words really touched me..it is so wonderful to feel heard when you put the love out there and you certainly made me feel heard today !Big Thank you hugs ! You deserved it Lynne! What a wonderful community I have found and I'm so lucky to have found you girlfriend! Congrats Lynne and such true words shared about our dear friend Karin. Can you believe it Lynne, I didn't even see my name here after Karin. I just noticed by you mentioning it to me. Thank you so much. I do love it anyway. three cheers for Lynne ... mhmm ... most definitely worthy. and thank you ... I honestly am moved that you'd include me in this. You certainly are deserving of this award Lynne. And thanks for opening my world to some new blogs here! Congratulations, you deserve it and it is such a beautiful award. I just happened upon your blog via Mary Ann Moss's! Boy oh boy do I LOVE your blog! Your doing some cool shtuff! I will be a regular visitor! lynne , congratulations on your award. i love your blog and how you share your work . it always inspires me to keep trying new things. your creativity is amazing . thank you for my award . you are so kind to include me. Thank you Lynne for this lovely award and your beautiful words. You warm my heart and make me smile ! Smiling back atya! Congratulations Lynne and to all your recipients. I'm loving your collaboration with Karen. Pure delight! look at what you have made from those stickers..
they look so ..real.. now..
thank you robyn, lumi, and roxanne! and blowing you kisses, jacky!